I'll be honest here, I can be pretty lazy when it comes to my hair, throwing it up in a messy bun is just so convenient! But when I got my hair cut I was determined to actually look after my hair more, and I've been pretty good at doing so. Where I was still falling short is continuing to just wear it up the whole time because I could never get it as sleek looking as the hairdresser, and straight hair just never does what you want it to do. 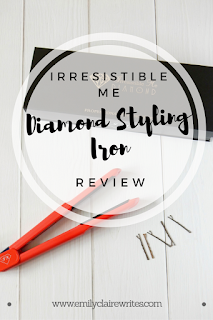 When Irresistible Me got in touch and asked if I'd like to review their Diamond Professional Styling Iron* I was pretty excited, I've never really used hair tools other than a hairdryer before so I was looking forward to seeing if this cold be what takes me out of hair laziness. Having it used the iron for a few weeks I can confirm that it's taken me right from constantly wearing my annoyingly flicky hair up and out of the way, hating the idea of not styling my hair with it. Firstly considering it's shipped from America I was hugely impressed with the speed of delivery, it arrived in just a few days which is a huge plus for me. The hair tool itself is packaged in a beautiful matte black box, with the most satisfying magnetic opening. I actually use the box as storage for it when not in use because it just looks so sleek. The box also has details of all the features, which are rather extensive and I have to say I was very impressed. The plates of the iron feature diamond technology which helps add a shine to your hair and keeping it completely frizz and static free. The temperature display is really clear and more of it lights up depending on how hot you heat the tool up to. The buttons are on the inside of the tool there's no way you can accidently turn it up too high or turn it off whilst you're styling, which is so helpful as there's recommended heat settings to use depending on the thickness of hair. Not to mention that the heating up and cooling times of this are amazing, hardly have to wait for it to be heated before yo can start using it, which is a definite plus for me in a rushed morning. When using the tool it's recommended to use a heat protectant, and whilst the leave in conditioner I use does have an element of heat protectant in it, as I mostly use the styling iron after blow drying my hair I add a quick spritz of the Tresemme Heat Protecting spray first. As I do have naturally straight hair I don't use this in the conventional straightener/flat iron way to completely straighten my hair. Naturally straight hair isn't that sleek, and by the very nature of natural hair, it never does what I actually want it to. Half of it slightly flips under at the ends and half of it flicks out and looks awful. 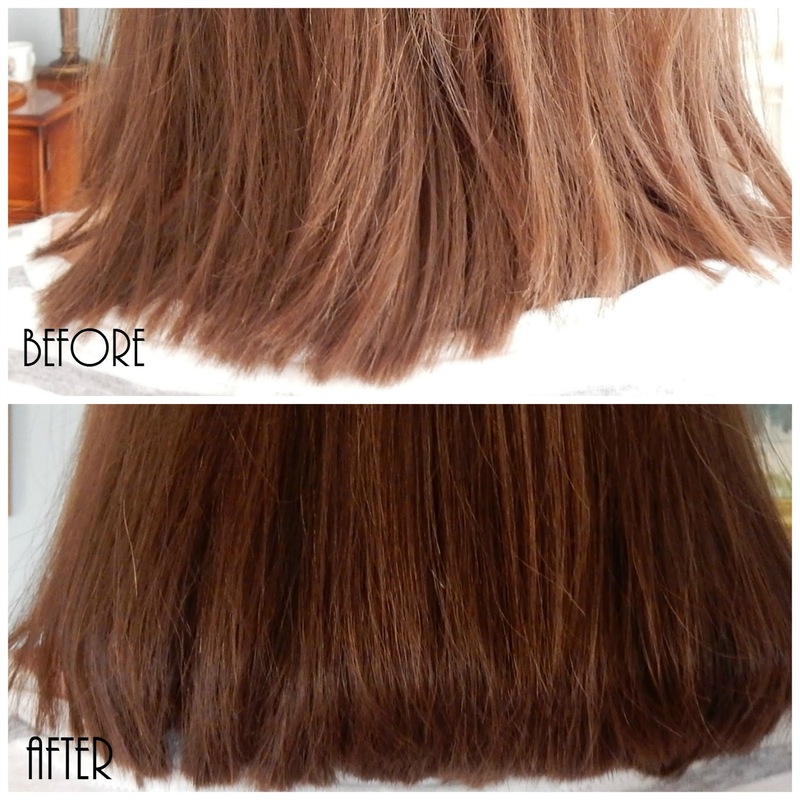 Taking a section of brushed hair, I run the styling iron on a medium setting of 180 from about half way down keeping my hair straight, before turn the iron in towards my head at the ends. Just ever so slightly to give a more polished look to my hair. Considering I have very limited experience using hair tools I was pleasantly surprised at how easy it is to use. It's so lightweight and the plug cord is not only long making it easy to reach around your head, but it's also a 360 swivel cord, which adds to the ease of use. As you can see in the before and after, it's literally just the ends that I bring under slightly, but it really does make all the difference in adding a little extra volume and a much sleeker finish to my hair. The ease of using the diamond styling iron really does make me feel like I'm still being lazy with my hair, yet I look more put together and style it near enough every day. I'm still practising creating loose curls and waves using the iron, which the heat resistant cover really helps with as I can hold onto the cool tips with my other hand as I'm curling. Overall I'm hugely impressed with the diamond styler and highly recommend it. The iron itself costs 149 USD which currently works out at around £112 but it's seriously well worth the investment. 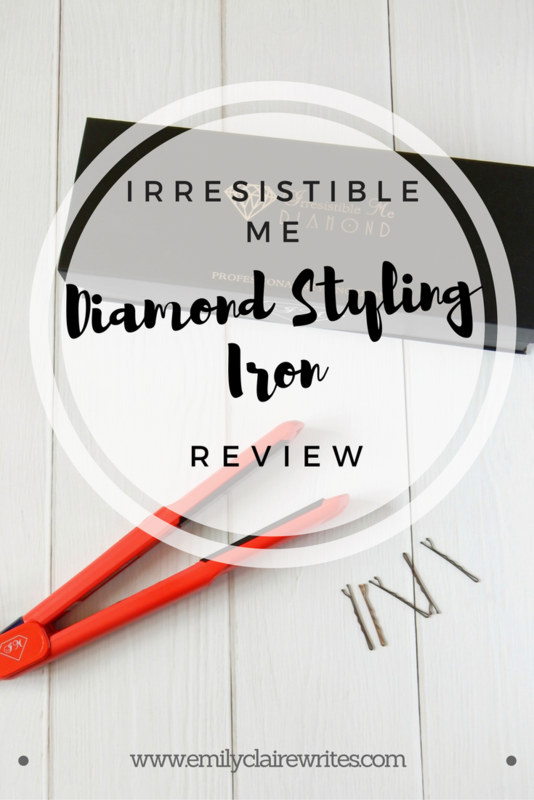 I've been completely amazed at how easy the Diamond Styling Iron has been to use, have you tried anything from Irresistible Me?